(ispovednik.org) On June 12 (May 30 O.S. ), Archimandrite Nicholas (Iuhos) was consecrated Bishop of Cincinnati (if we are reading this correctly– NFTU) by order of the Synod of the RosOC during their Council of March 29-April 1 (New Style) in the service of the RosOC’s North American Vicariate. Bishop Nicholas was consecrated by Metropolitan Damascene of Moscow, Archbishop John of Zaporizhzya and Little Rus’, and Bishop Andrian of Chisnau and Moldova, exarch for Ukraine before a large crowd. After the consecration of the Episcopal Primate and Bishops of the RosOC warmly congratulated Bishop Nicholas and the parishioners of Holy Assumption Church with such a joyful event in the life of the Church and wished to Bishop Nicholas success in serving God in the highest rank of bishop. 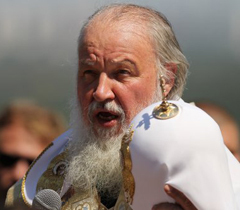 In his response, Bishop Nicholas (Yuhos) thanked the Metropolitan, the Archbishop and Bishop Andrian, promising to carry the cross of the episcopal dignity, with the help of God to increase the Orthodox flock in America, and to do his utmost for the benefit of the Russian Orthodox Church.